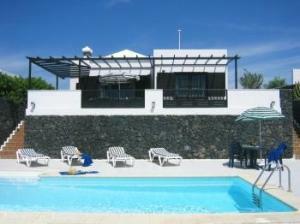 Address: Barqueta, 12, Puerto del Carmen (Lanzarote), Islas Canarias. Set in a tranquil and central area of Puerto del Carmen, on the island of Lanzarote, this villa complex is the ideal place to enjoy a relaxing holiday with the family or as a couple. The Don Rafael Villas feature the whitewashed design typical of the island, and come with superb modern facilities. Relax and sunbathe in the gardens around the private swimming pool in these villas. You can also have barbecues on the private and secluded terraces of each villa. The villas also enjoy great views of the sea. Make use of free Wi-Fi to chat with friends and to search for tourist information. The Don Rafael complex is set surrounded by great supermarkets, restaurants and shops, and is just a short walk from the coast’s fantastic beaches. If you have a car, you can visit Timanfaya National Park, situated on the west coast of the island. You can also head to the nearby, modern golf course. Please inform Villas Don Rafael in advance of your expected arrival time. You can use the Special Requests box when booking, or contact the property directly with the contact details provided in your confirmation. Guests are required to show a photo identification and credit card upon check-in. Please note that all Special Requests are subject to availability and additional charges may apply. A security deposit of EUR 50 is required upon arrival for incidentals. This deposit is fully refundable upon check-out and subject to a damage inspection of the accommodation. Please contact the hotel in advance to confirm your time of arrival. The hotel reception is open from 09:30 to 13:30, but can be contacted at outside these times on the phone number which will appear on the Booking Confirmation issued by this site.